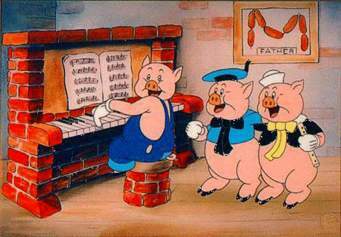 Is there any fable that has lasted as long as the story of “The Three Little Pigs?” It is a great analogy that can apply to spiritual life. 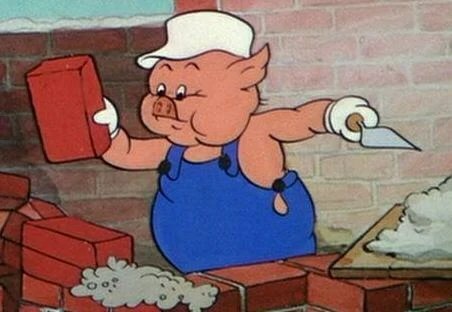 Like these little pigs, each of us must build a secure dwelling place or we will not survive. Another truth comes through- the Wolf is out there and he’s quite a windbag. The pigs know this very well, so we might wonder why two of them built so poorly and used such bad material? Apparently, despite the reality of the Wolf, they were diverted by other “occupations.” They did enough to get by and lived in a bit of denial that the Wolf would never come. Jesus said that the only thing that marked the difference between a wise man and a foolish man is the foundation upon which he stood. The winds and waves will surely come and beat against every house without exception. The only house that would stand would be the one with the right foundation. This foundation is his teaching and we have heard these teachings through the witness of the Holy Apostles. When asked what is the foundation of my life, Christ and the Apostles is my only answer. In His wisdom, God did not leave this foundation work to us. In our rush to build, we would go cheap on the foundation. After all, the foundation is not the most attractive part of the building. God has built a strong and level foundation and upon this foundation He is building His Church. It is upon this foundation all of us must build. We might ask that if the foundation is there, why be in a rush to build? Well, we would think a person to be mighty foolish if, after building the foundation, he sat there in the open with no walls and a roof. This is the plight of many. They stand on the right foundation but they have not built the rest of the house. They will be saved, but it will be at a terrible price. The Wolf will not spare them at all. I hear people say that they are not religious, but that they are spiritual (as if being spiritual is something that just happens). We fool ourselves if we think that we can build any kind of spiritual life without the right tools. The tools of spiritual building are prayer, fasting, and charity. I think that I would add another necessary tool: study. Failure to use these spiritual tools would be like showing up at a work site only to find that no one had any hammers or saws. We would fire the contractor! Besides tools, you need the right materials. St. Paul speaks about the materials that we use in building our spiritual house. Good materials would be faith, hope, love, kindness, goodness, gentleness, meekness, and self-control, etc. A house built with this material will withstand anything that comes against it. The wolf will always blow against the house. Count on it. If we try to build with anything else, the structure will fall with the first puff of wind. Like two of the pig brothers, we are often careless about how we build our spiritual houses. We want to believe that the wolf will never be at our door. This is a remarkable faith since we all have a history of disaster, testing, illness, hard times, and temptation. It is the job of the Wolf to be at our door and he is persistent about it. Why does God allow this to happen? Is it because we are bad and God has to punish us? 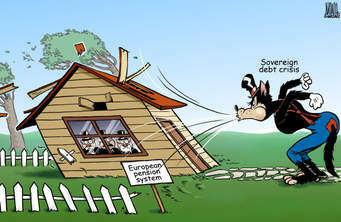 It may be that we are lazy pigs, but God doesn’t allow the wolf to come to punish us. St. Paul called this testing “fire.” When the fire comes, it tests what we have built. If we have built with wood, hay, or stubble, it will not stand the test. We will suffer loss, but maybe we will have learned something valuable. The Fathers tell us that testing is proof of God’s love. God does not want us to live in substandard housing. How many times has my little house fallen to the ground and I am just shocked at how easily it crumbled. I thought I had done a much better job this time. Only testing proves whether it is sound or not. Still, it is a grievous thing when I am shown again and again that I did not build very well. Now I know why God didn’t allow me to lay the foundation. Each time my building crumbled, the foundation was never destroyed. Thank God. This allowed me to clear away the debris and begin again. Did I learned my lesson? Will I do a better job this time? I hope so. St. Paul puts it this way: even if our entire spiritual house crumbles in the face of a test, we ourselves are not lost. As long as we stay on the foundation, we will be saved. So why worry about anything else? St. John Chrysostom advises: “ Don’t just cling to the foundation, but build upon it, and be cemented to it. For if we ever stand apart from it, we shall surely perish.” Imagine if you heard that my house burned down, and several weeks later you saw me sitting among the rubble watching TV as the rain came down. Upon inquiry, you discover that I plan to stay that way, since I believe that all I need is the foundation. Foolishness!! With or without walls, the wolf will come again. With no walls, he will try to blows us from the foundation, and it will be hard to hang on to the foundation because the wind can be fierce. Walls and a roof sure make it a lot easier to hang in there. In the end, there is one test that we will all face. Death will test all of us to see how well we have built our spiritual house. Yet, even here, if our house falls as we pass through the gates of death, if we remain on the foundation of Christ our Lord, even then we will be saved. Finally, this analogy can have a corporate application. The Church is built on the foundation of Christ and the Apostles. It is an ongoing work and St. Paul wrote that we are “laborers with God.” We need to build well in our own parishes and here we need the right tools and the right materials. The bonds of love, fellowship, and forgiveness must be strong between us. I have often seen the Wolf blow against a parish or even a jurisdiction. The resulting destruction was terrible to see. It became evident that that fellowship did not build well. However, at such times, we must not lose heart and remember that there is a foundation laid that cannot be moved. Standing upon it, let us begin to build again. This analogy applies to marriage as well. In the Sacrament, we try to lay the foundation of the relationship. From there, a couple must build upon it. If a marriage is to last, it depends upon what materials the couple used, what tools are employed, and how well they built. Trouble will most certainly come and it comes to all couples. In fact, the way that the Wolf tries to destroy the Church is through marital discord and divorce. Couples who go through difficult times need to cling the foundation of their marriage which is the abiding love and presence of Christ. There was a good brother pig. He knew the value of a house well built. He also knew the Wolf would come. So he built with good bricks and mortar. Eventually, the foolish brothers had to run and take refuge with him. I would point out that even then, the Wolf did not give up. He tried to come down the chimney, but the wise pig brother was ready for him. He had the fireplace ready, and when he lit the fire, the Wolf perished. For us, the fire in the fireplace is the Holy Spirit which burns within us. This entry was posted on May 23, 2008 at 8:33 pm and is filed under Orthodox Life, Podvig - Spiritual Struggle. You can follow any responses to this entry through the RSS 2.0 feed. You can leave a response, or trackback from your own site.